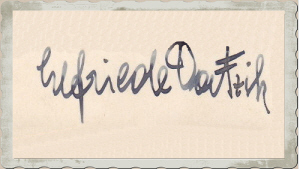 The actress Elfriede Datzig was born as Elfriede Datzik and she appeared as Datzik in her first movies before she changed her name to Elfriede Datzig. She was able to appear in some remarkable movies in her short life and soon became a popular actress. To her well-known movies belong "Die unruhigen Mädchen" (38), "Hotel Sacher" (39), "Meine Tochter lebt in Wien" (40), "Der ewige Klang" (43), "Der weisse Traum" (43) and "Sieben Briefe" (44). She was only 23 years old when she was unexpectedly tore away from her life. As a result of a pneumonia and pleurisy she was treated with penicillin, a medicament she reacted allergic to it and led to her death. Elfriede Datzig was married with the actor Albert Hehn. They had a son by the name of Michael.